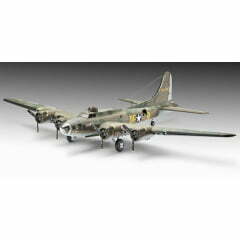 During the Second World War the Boeing B-17 became a synonym for the heavily armed strategic bomber. The Boeing B-17F was also the first Flying Fortress to be manufactured using mass production techniques. The most famous aircraft in this series was a B-17F which was delivered on 15th July 1942 and entered service with the 324th Bomber Squadron in England. Her crew named her the "Memphis Belle" after the girl-friend of her pilot, Lt. Robert K. Morgan. She became famous due to the fact that she was officially recognised as the first U.S. Army Air Force bomber to survive 25 missions in Europe and subsequently became the star of a propaganda film made in Hollywood. After this mission the "Memphis Belle" and her crew were ordered to return to the United States. She was later "bought" by the city of Memphis and used as an Open Air Memorial. In all, a total of 12,677 B-17's were built.